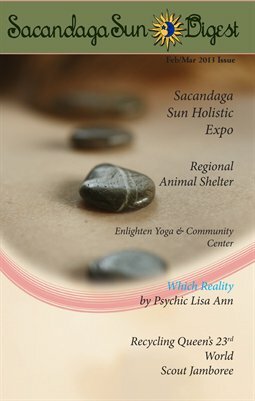 Shelley Brienza is the Owner and Creator of Sacandaga Sun Holistic Digest. As the Editor and Publisher Shelley works with the design and graphic layout of each article that is submitted from the writers and advertisers. She often says how she couldn’t do it without her great staff and open-minded contributors. Shelley is a gifted writer. She uses her natural born talent for writing and the desire to share like-minded knowledge of the body, mind and spirit realm by teaching others what is available as alternative wellness or holistic lifestyle choices for people and animals. She is a highly respected writer presenting knowledge in a method, which is easy to understand. It is because of her love of teaching others that she decided to create Sacandaga Sun Holistic Digest. Brienza states, "I wanted a publication that freely shared knowledge while educating those who sought it out.” It is also important to her that she gives back to our communities and she tries to do this through events and donations.